Manila, Los Baños, Cebu City, Naga City, Bacolod City, Davao City, Iloilo City and other capital cities nationwide. 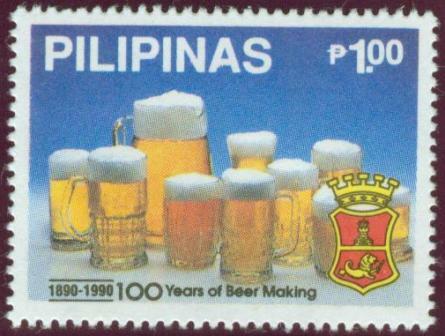 This commemorative stamp marks a milestone in Philippine industry - the beer industry's hundredth year in the country. 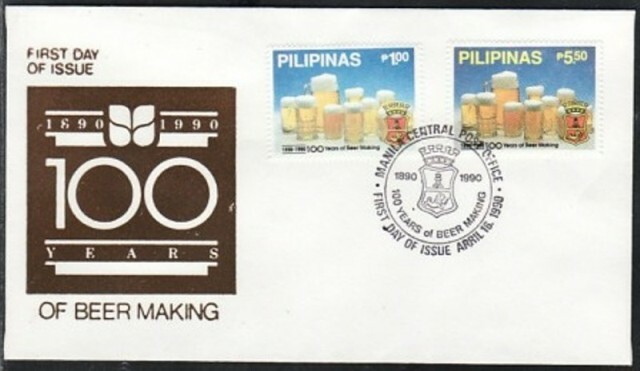 The stamp's significance likewise serves as testimony to San Miguel Corporation's one hundred years of being part of the country's social, political and economic history from 1890 to 1990. Through the years, San Miguel Corporation (SMC) has become an institution, an integral part of national life, of national tradition. SMC's one hundred years may well represent what the Philippines as a nation has been working for a life of enterprise, vision and innovation, of dedication to excellence, of commitment to public welfare and improved quality of life. Today San Miguel Corporation and its subsidiaries generate about four per cent of the country's gross national product, and contribute over seven per cent of the government's tax revenue, providing livelihood to thousands of Filipinos. SMC's celebration of its centenary is a celebration of Philippine tradition. 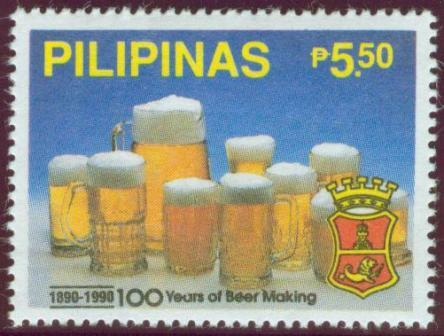 The stamp design reflects the importance of beer making as a major industry with an impact on Filipino life. The foaming beer mugs and the "excudo" represent San Miguel Beer, the very first Filipino beer brewed at La Fabrica de Cerveza de San Miguel.